20-08-2016. Picture Michael Gillen. DUMFRIES. Palmerston Park. Queen of the South FC v Falkirk FC. SPFL Ladbrokes Championship. Stephen Dobbie 11 and Tom Taiwo 7. Stephen Dobbie’s classy double put Falkirk to the sword in Dumfries. 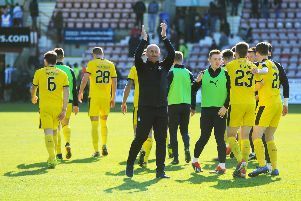 The striker, who returned to the Doonhamers after spells at Blackpool and Swansea, struck a goal in each half and extended Falkirk’s disappointing start to the season. 20-08-2016. Picture Michael Gillen. DUMFRIES. Palmerston Park. Queen of the South FC v Falkirk FC. SPFL Ladbrokes Championship. Lee Robinson 1 and John Baird 9. Falkirk have won just TWO competitive matches away from home this calendar year, and none since February. They put up a test for Queen of the South but they were out-fought by the Doonhamers, then out-classed by Dobbie. Falkirk, in the early exchanges gave as good as they got. Craig Sibbald looked lively playing off a front pairing of Bob Mcugh and John Baird – the latter becoming a target for the home fans where he once plied his trade and later as frustartion mounted, a section of the away support turned on last season’s top scorer. Behind them, Tom Taiwo put in his usual bustling performance before taking a headknock which required post-match stitches from the club doctor, and it contributed to the opener. 20-08-2016. Picture Michael Gillen. DUMFRIES. Palmerston Park. Queen of the South FC v Falkirk FC. SPFL Ladbrokes Championship. Header, Luca Gasparotto. With Taiwo off receiving treatment Queen’s launched balls forward. Luca Gasparotto repelled the advance but when another long pass found Derek Lyle the frontman played into the path of Dobbie – granted free reign by the depleted Bairns midfield and the striker left Danny Rogers flat footed with a curled finish from outside the box. In truth Rogers had little to do, certainly in the first half. His opposite number, Lee Robinson made a wonder save to deny McHugh and was the busier of the two, though never troubled aside from his one flamboyant stop. It was similar after the restart and again the second half hinged in a moment of magic from Queens returning talisman. 20-08-2016. Picture Michael Gillen. DUMFRIES. Palmerston Park. Queen of the South FC v Falkirk FC. SPFL Ladbrokes Championship. Falkirk fans. Aaron Muirhead did well to head a deep cross out of the six-yard box, but his attempt fell at the feet of Dobbie who curled in off the underside of the bar to knowck the stuffing out of Falkirk. The Bairns looked for a response but it was meek. Several headers from Paul Watson and Luca Gasparotto went close, but not close enough, and Queens twice could have extended their lead. Rogers blocked from Lyndon Dykes one-on-one and Paul Watson prodded away the rebound, and the Australian was denied too by Luca Gasparotto who stopped his scrambled effort trickling over the line. 20-08-2016. Picture Michael Gillen. DUMFRIES. Palmerston Park. Queen of the South FC v Falkirk FC. SPFL Ladbrokes Championship. Gavin Skelton and Peter Houston. Predictably Gavin Skelton was delighted with another win which keeps his side at the top end of the table but Peter Houston said: “We’re losing soft goals. We lost a side-foot from 25 yards.